An interesting thing occurred to us while we were browsing for good deals to report on today. Upon entering eBay's main page for tech deals, we were greeted by a listing for the recently announced Samsung Galaxy S10+. At a first glance, one could assume that this is some sort of pre-order offer, as the S10 lineup is supposed to hit the shelves on March 8. However, when we decided to investigate further, we were surprised to see that the phone is already advertised as being "in stock" and ready to ship. At the time of writing, 95 people have already bought the phone and more than 340 people are viewing it per hour. 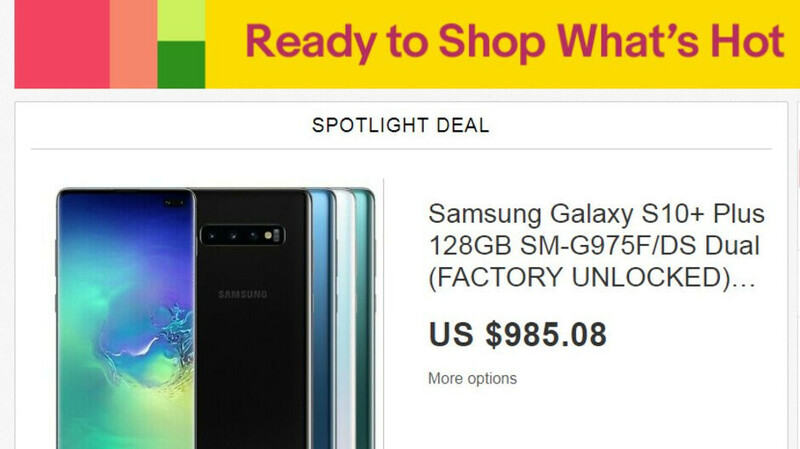 This huge interest is due to the fact that eBay has decided to make this offer a "spotlight deal", meaning that the listing will appear first to any user browsing for tech and for phones at the e-commerce site. Now, we feel obliged to say that eBay offers money-back guarantees for this product and that the listing comes from a top-rated reseller. Still, we can't help but feel that there's something fishy going on here. We understand that some of you might want to get their hands on the S10+ before anyone else, but here's why it might be better to avoid this deal. Even if we assume that the reseller has the Galaxy S10+ in stock and ready to ship (and that's a stretch), there are several important reasons as to why you might want to buy the phone through an official retailer. While the units sold are unlocked and come with dual SIM slots, this is an international model that doesn't have a warranty card. This means that you'll have to pay a pretty penny if something goes wrong with your phone early on. Furthermore, color options are limited, as currently, you could only get an S10+ in white or black. Also, this type of S10+ is not compatible with CDMA networks such as Verizon and Sprint. Last but not least, pre-ordering the S10+ through an official store will get you a free pair of Samsung's new Galaxy Buds wireless earphones and in our humble opinion, they are worth the wait. At the end of the day, we doubt that anyone who bought the S10+ through this eBay deal will lose their money, but there's a high chance that buyers will have to wait till March to get their phones, as the possibility of a third-party reseller having unreleased flagship phones in stock is highly unlikely. When combined with the other factors mentioned above, does this listing truly deserve to be a spotlight deal? Let us know what you think in the comments! I'd be skeptical because the actual "official" release is on March 8th. I hope these people get their money back if they realize it might be a knockoff or an unofficial phone. How did this Ebay seller manage to get stock? I'm still deciding whether to get the T-Mobile version or the unlocked US version directly from Samsung. Get the T-Mobile version directly from Samsung. Get unlocked, all models have the same network bands so you’ll be good, even with the new 600mhz T-Mobile has. Also unlocked will give you less pre* installed carrier bloatware you won’t need, but can also download when you wish. Cheers! From my research, and using Note 8 and 9 as a reference, it seems virtually all the features on the T-Mo version works just fine with the unlocked phone except RCS. Apparently this is because T-Mo is using a proprietary RCS derived service called Advanced Messaging. I don't believe this is even a big deal to me tbh. As for Band 71? I switch phone every two years but I live in the Chicago area and they can't deploy it til 2020, at the earliest. That's when all last the TV station(s) repack their spectrum (see, you learned something new lol). And there's a mayoral election this month for a new mayor and I've a feeling that would affect the roll out somehow because, you know, Chicago politics haha. So I am leaning towards an unlocked version. I say they pre-order a bunch. Get the free accessories and then sell the accessories separately. Even selling the phone at a loss the accessories will more than make up for. Smart sellers.